The living dress was made by Vinilla Burnham but designed by Gaga. It was debuted in 2010. Right before the dress was shown Gaga tweeted, “2nite Haus of Gaga debuts “the living dress” inspired by Hussein Chalayan, as a fashion moment to be performed in “pop show” at Monsterball.” Gaga uses the dress for her Monster Ball Tour. The dress was actually finished just two hours before it was debuted. It took Vinilla Burnham six weeks to make the dress. The fabrics used was used to created the dress are, stainless steel, various forms of nylon fabrics, sheet and rods, different weights of plastic sheeting and coutil for the corset. The dress is actually extremely heavy if you lift it up but when worn the weight is distributed evenly. I love this dress. When I saw Gaga live the dress took my breath away. The fact that it moved astound me. When I saw the dress the stage lifted up and Gaga was their singing, then the dress started to move. 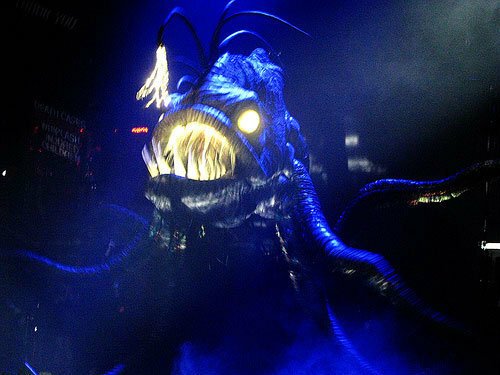 The angler fish or fame monster is a prop used during the song Paparazzi in the ‘Monster Ball Tour’. When the song begins the Angler Fish appears, It’s eyes glows, the angler, and it’s teeth as shown to the picture to the right. As the song continues the song bites down and takes off Lady Gaga’s skirt to reveal a leotard. Gaga then puts her Pyro-bra or fire bra. It’s a remote control spark shooter bra. I will review that outfit in a later post. Back to the fame monster, Gaga tells her fans that she can’t kill her fans herself. Gaga says that the whole story behind the fame monster is that when she was younger, the fish was one of her biggest fears. She says that it’s really great defeating her fear on every night of her show. The fame monster is puppetered by her dancers, with 2-3 dancers operating each tentacle. The fame monster represent fame and gets killed by paparazzi.